Service Area | Blackhawk Express Freight & Messenger, Inc. 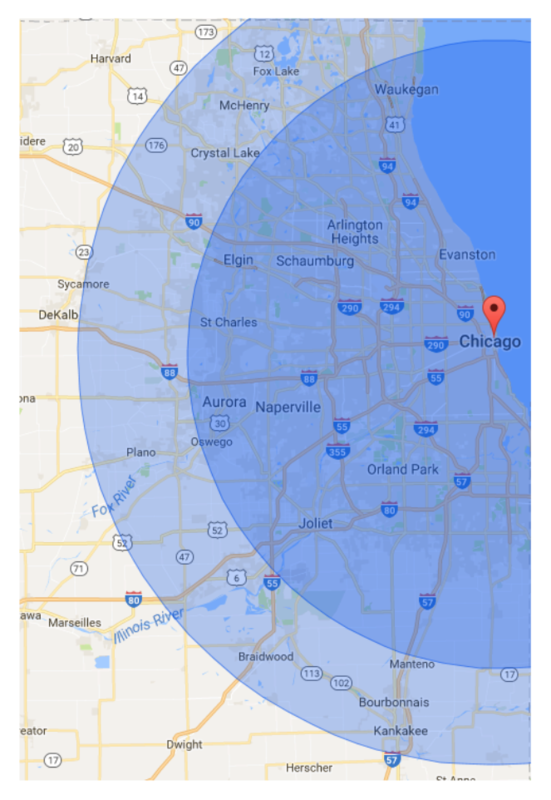 The following zip codes reflect all the cities that qualify for local delivery pricing because they are within 45 miles of downtown Chicago. The dark blue area in the map gives a visual of what that radius looks like. The light blue area shows all the areas beyond the standard pricing area that qualify for local delivery plus a surcharge. Please reference the Freight and Messenger tabs to find out how this area affects pricing and service levels for your delivery needs. All deliveries beyond the shaded areas are considered Hot Shots because they are beyond 60 miles.